The best baked macaroni and cheese recipe! This kid favorite includes a creamy veggie.. pumpkin! Healthier ingredients, still lots of cheese! As we developed this mac and cheese we saw lots of delicious recipes that included everything from mayonnaise to butter to cream cheese – no doubt delicious, but also not the healthiest. While we kept plenty of cheese in this recipe, we substituted Greek yogurt for lots of these fats. The yogurt not only cuts down on fat but also increases protein – and adds a little tang. Pumpkin was added in order to add some creaminess and vitamins! 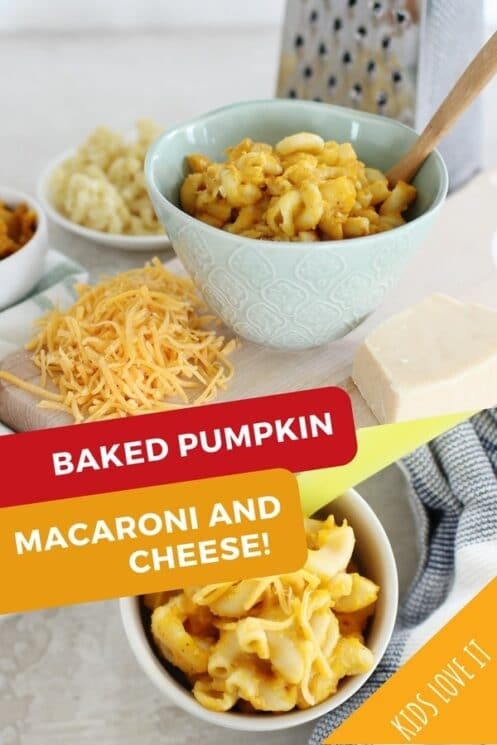 Pumpkin is used in place of fats in some baking, so why not also use it in macaroni and cheese!? Plus, the color is totally perfect and sneaks the veggie in nicely. We considered adding additional veggies, such as spinach, shredded carrots, mushrooms, etc. In the end, we decided to keep a basic recipe because sometimes you just need straight up macaroni and cheese! Feel free to add the vegetables that work best for your family, just make sure to wilt the spinach or sauté the mushrooms a little first. Even though this mac n’ cheese is meant to be baked, we found that cooking noodles first was helpful. Make sure to boil them until juuuust al dente – firm enough that they can handle some time in the oven afterward. Drain well but do NOT rinse. We need the noodles to keep all that starch to help thicken the final cheesy mixture. While the noodles are cooking, prepare a casserole dish by spraying the pot or lining, if using. Cheese tends to stick, so you’ll want it well-greased. Then add the pumpkin, milk, and Greek yogurt. 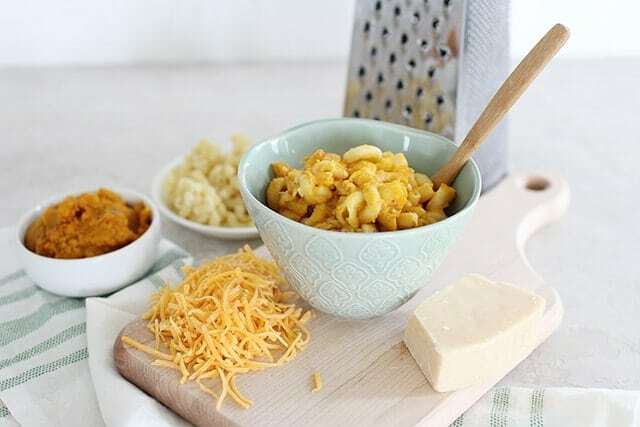 In a medium bowl, combine all the spices and flour, then toss in the cheddar and parmesan cheese so that the spice-flour mixture coats it well. Mixing this way helps keep the flour from clumping and gets all the flavor well-distributed. Pour the cheese-spice mixture into the casserole dish and mix everything well. Add in the noodles and stir again. Bake the mac and cheese for 30 minutes, stirring occasionally, until everything has melted together. Make sure not to leave the noodles cooking or even on ‘warm’ too long – after a while they tend to get too mushy. The cheesy mixture might look a little separated while very hot, but once it cools just a bit it comes together nicely. Serve with some fresh veggies and fruit for a kid-friendly dinner. 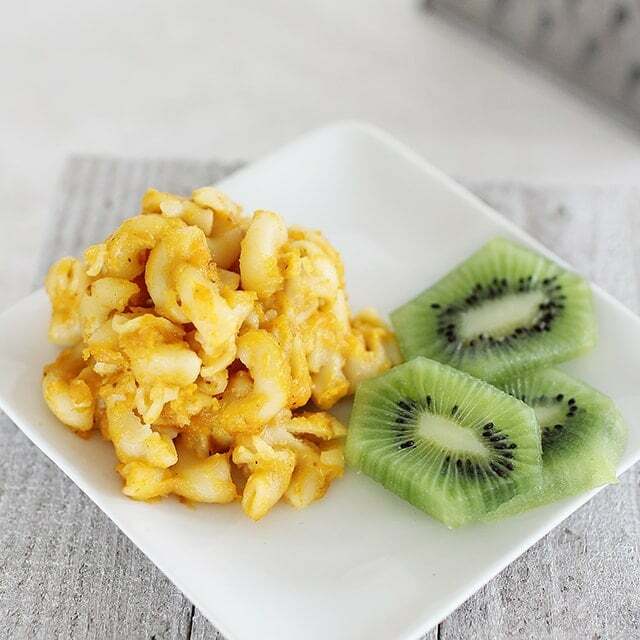 We loved this tasty, cheesy, healthier take on macaroni and cheese! Preheat oven to 350 degrees F. Grease a 9×13-inch baking dish and set aside. Cook noodles until very al dente (only about 5 minutes). Drain but do not rinse. Add the pumpkin, milk, and yogurt to the prepared baking dish. In a separate bowl, toss the grated cheddar and Parmesan with the flour and seasonings. Add to the baking dish, and stir well. Add the noodles, and stir gently to combine. Bake for 30-35 minutes. So, the trick here is to come up with a food that’s healthy yet, too delicious kids wouldn’t know they’re eating veggies and this is just a perfect one. I tried this and used bentilia pasta and added more cheese for my cheese lovers. So glad you and your kids loved it! I’ve been told to never put milk products in a slow cooker. I’m guessing that your secret is that it’s only for an hour? Otherwise the curds will separate out of the milk. Your readers should know not to leave this in the cooker for 6-8 hours! I tried cooking this one and it makes me feel to cook again. My kids just love the tasty milk and the bentilia pasta I used also. Thanks for the recipe! Now I’m looking for another recipe from this website to serve my little picky eaters. Not trying to be rude, but looking at the nutrition facts: how in the world is that healthy? I would not feed that to my child. Hi Mandy! Thanks for your feedback. Our serving sizes were underestimated. I have fixed them and the nutrition facts should be slightly more appealing. Hi , do i need to cook it for 1 hour in crockpot? Can i just cook it in pan for like 10-15 minutes? Very good! My kids enjoyed it, as did my husband. I left out the sage, as I wasn’t sure how my picky eaters would take it. Pretty good! A little too thick, I’ll make the sauce a bit creamier next time. I thought this was a bit bland. Could use more cheese. I did make this vegan using soy products but not soy cheese. I used two tablespoons nutritional yeast instead of the cheese. The flavor was good and I think I would double the pumpkin sauce next time as the noodles on top were crispy. Or smear it with a tomato/pizza sauce. A good starting recipe! I loved this—cheesy, creamy, and filling. Kids wouldn’t touch it, but they don’t eat mac and cheese anyway. They were happy with the plain noodles that weren’t needed for the recipe. Amazing flavor! But I am going to add more macaroni next time. 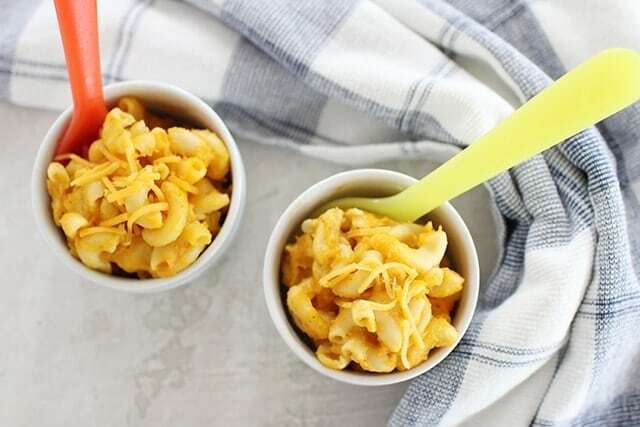 I have to make this in large servings because my girlfriend, her son and I aaallll love macaroni and cheese. I have to surprise them with this for dinner soon! The mustard spice really came through strong for us and wondered if anyone else had that experience? I’m 98% I measured it correctly. This was a huge hit with my family! Made it a complete meal by adding in chicken, mushrooms and spinach. Sauted the mushrooms and cooked (cubed first) the chicken before adding, but i just poured the hot noodles on top of the spinach to wilt it. I didnt bake mine as i am not a fan of baked mac and cheese, but rather, melted all the sauce ingredients in a sauce pan and poured over the noodles.